President’s abuse of authority strips protections from a priceless cultural and natural heritage that belongs to all Americans. Washington, D.C. — Two days after President Donald Trump issued a proclamation taking an axe to Bears Ears National Monument in southern Utah, conservation organizations filed a lawsuit attacking the order as an abuse of the president’s power. Following in the footsteps of the Native American tribes who have already sued the president, Earthjustice is representing nine conservation organizations, including the Grand Canyon Trust, in a suit charging that the president violated the 1906 Antiquities Act and the U.S. Constitution by eviscerating the monument. The unprecedented act leaves rare archaeological sites and stunning wildlands without protection from looting, prospecting, oil and gas drilling, uranium mining, or off-road vehicle damage. Bears Ears was decimated by more than 1 million acres. The Natural Resources Defense Council and Southern Utah Wilderness Alliance are co-plaintiffs in the case, represented by counsel from those organizations. Because the president’s authority to create national monuments is delegated by Congress under the Antiquities Act, monument proclamations carry the force of law and cannot be reversed by later presidents. President Trump lacks the authority to gut a national monument that belongs to all Americans. Home to ancient cliff dwellings, sacred tribal cultural sites, and iconic wildlife, Bears Ears National Monument is a national treasure. Its buttes, cliffs, and canyons include over 100,000 Native American archaeological and cultural sites, some dating to 12,000 B.C.E. To ensure its lasting protection from looting, mining and other threats, an historic inter-tribal coalition of the Hopi Tribe, Navajo Nation, the Ute Indian Tribe, the Ute Mountain Ute Tribe and the Pueblo of Zuni successfully advocated for its protection as a national monument. 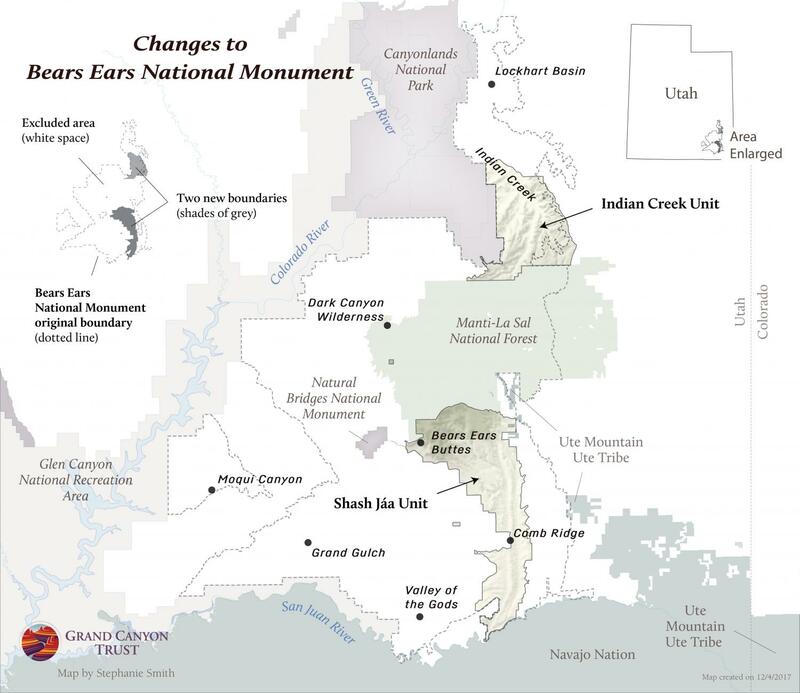 "Five Native tribes came together in an unprecedented way to protect Bears Ears National Monument," said Bill Hedden, Executive Director of the Grand Canyon Trust. "This remarkable area had been considered for national monument status for 80 years, and President Trump's action to eviscerate the monument after a hasty review dishonors not only their heritage, but our shared American heritage as well." President Obama designated Bears Ears National Monument on December 28, 2016 using the Antiquities Act, a century-old law that has been used by 16 presidents since Theodore Roosevelt to protect some of our nation’s most cherished landscapes and cultural heritage. Congress enacted the law in 1906, granting presidents the authority to create national monuments on federal lands to protect significant natural, cultural, historic or scientific features. The Antiquities Act does not, however, grant presidents the authority to diminish or rescind the monument designations of their predecessors. Only Congress can do that. "The President has the unquestionable authority to create national monuments, and a monument like Bears Ears shows why this law should be respected," said The Wilderness Society's Senior Counsel Nada Culver. "We will fight to make sure that both the law and this place are defended." "By revoking Bears Ears National Monument President Trump will be remembered for coming down on the wrong side of history," said Stephen Bloch, Legal Director for the Southern Utah Wilderness Alliance. "The federal public lands and significant cultural resources within Bears Ears National Monument are world class treasures that demand the highest level of protection and respect. President Trump's broad attack on Bears Ears — the first by any President in the 111-year history of the Antiquities Act — puts these lands and resources at immediate risk of damage and destruction and cannot stand." The thousands of archaeological sites in Bears Ears are in dire need of protection from ongoing looting and desecration. No fewer than six serious cases of looting were documented in 2016 alone. These majestic lands are also threatened by uranium mining and oil and gas drilling. Bears Ears National Monument is home to bears, cougars, and bighorn sheep, and is dominated by two buttes that jut thousands of feet above canyon lands to form the region’s namesake, “Bears Ears.” Bears Ears National Monument continues to be used for pilgrimage, prayer and ceremonies to this day, and is a healing place vital to sustaining Native American culture and religion for the Tribes with sacred ties to these lands. “Overturning protections for critically important parts of the Bears Ears National Monument is an insult to people across the country who love and care about our public lands, and it’s a threat to the special places we leave as legacy for our children," said Michael Brune, Executive Director of the Sierra Club. "Some of America’s best-loved national parks, such as Grand Canyon, Olympic, and Grand Teton, started off as Monuments that were designated amid a storm of local controversy,” said Erik Molvar, Executive Director of the Western Watersheds Project. “Twenty years from now, if our suit is successful, Bears Ears will be famous and treasured and its opponents will look just as foolish and short-sighted as those who opposed the Grand Canyon’s designation." “It’s appalling that the president prioritizes the financial interests of the fossil fuel industry over protecting this incredible, vulnerable landscape that belongs to every American,” said Chris Krupp, Public Lands Guardian for WildEarth Guardians. “The president somehow kept a straight face at the signing ceremony when he spoke of increasing public access, but his only concern was industry’s unfettered access to Bears Ears’ resources." Earthjustice represents nine groups challenging President Trump’s unlawful action: The Wilderness Society, the National Parks Conservation Association, the Sierra Club, the Grand Canyon Trust, Defenders of Wildlife, Great Old Broads for Wilderness, Western Watersheds Project, WildEarth Guardians, and the Center for Biological Diversity. The Natural Resources Defense Council and Southern Utah Wilderness Alliance are co-plaintiffs in the case, represented by counsel from those organizations. Every president since 1906 — with the exception of Presidents Nixon, Reagan, and George H.W. Bush — has used the Antiquities Act to protect iconic places. The law has also been used to protect cultural heritage sites — from Stonewall to Birmingham to Cesar Chavez’s family home — that tell the more complete story of our nation. "President Trump's action to eviscerate the monument after a hasty review dishonors our shared American heritage."